I warn you this is going to be a photo-heavy post - quite possibly my most photo-heavy post ever, but I must share all the details with you, as this is quite possibly the most amazing piece of mail I've ever received. I have to zoom in on all these little details, because they just blow me away. 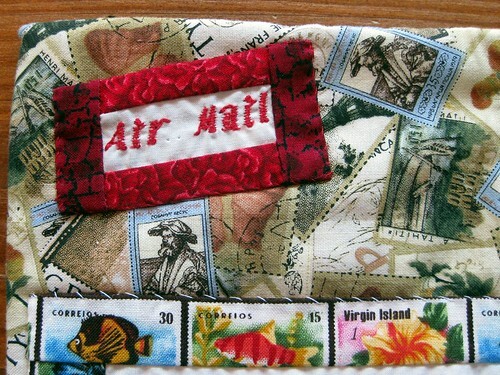 Embroidered air mail! 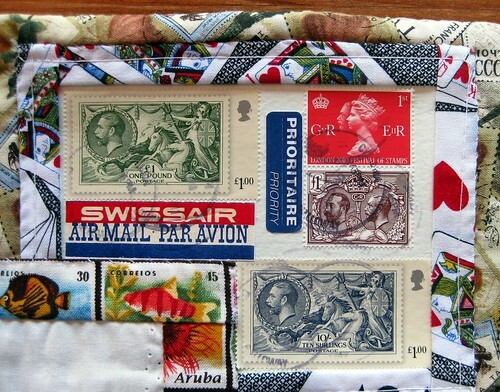 Multiple different kinds of stamp fabric! Meta mail to make me swoon! And postbox stamps! Glorious red postbox stamps! Does it get any better than this? I don't think so. 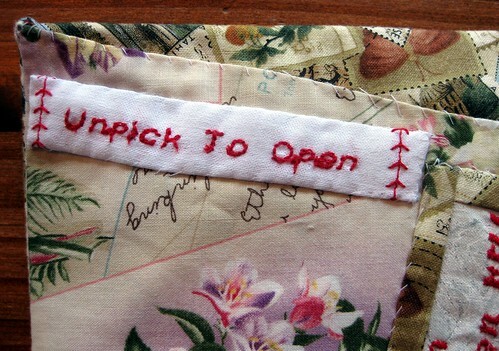 I don't sew myself, not anything, not ever, not even a button - so I am even more impressed by this. 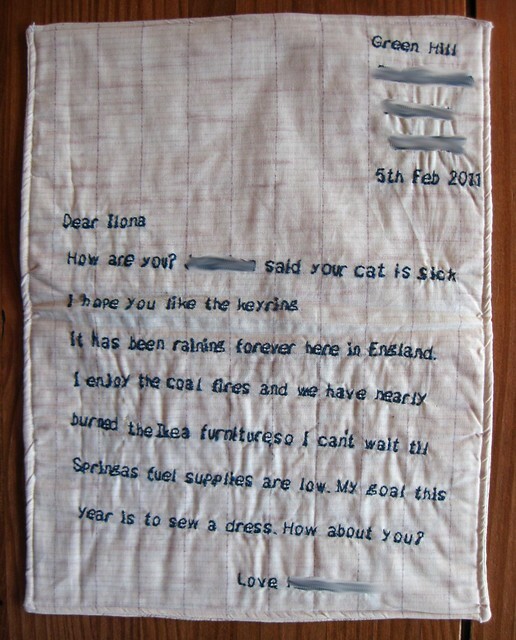 Does this sort of hand-embroidering of every single letter not take a ridiculous amount of time? It seems to me it must. Now, on to the back. 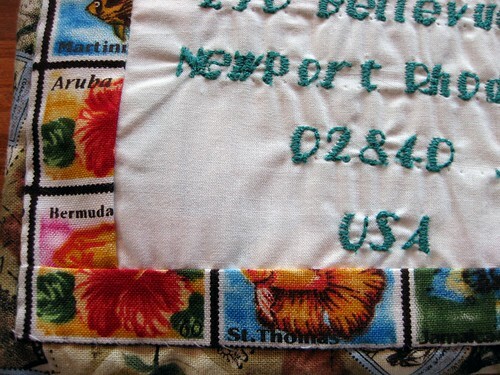 It had that "Unpick to open" embroidery with which I started this post, plus a hand-embroidered return address. And opened - there's even DIFFERENT liner fabric! You can see a bit of the letter peeking out here. 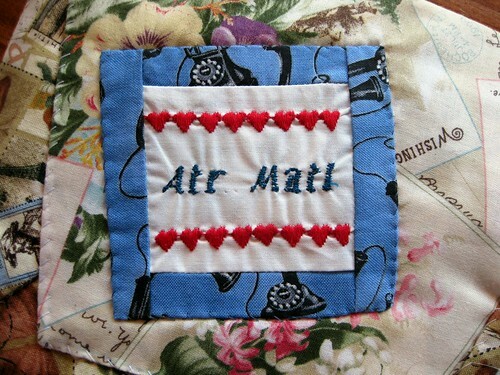 Also, because two is better than one - another hand-embroidered air mail label, this one complete with hearts. Lest you think it couldn't get any better - as I did, after I'd unpicked the stitching on this envelope (which I did very, very carefully, having no idea of the proper unpicking technique) - here's what was inside the envelope. 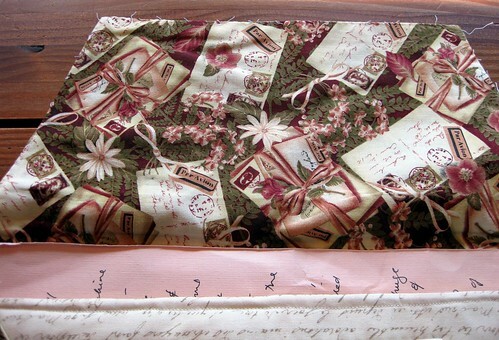 This is like the "stationery," the fabric with all the vintage-esque cursive writing on it. 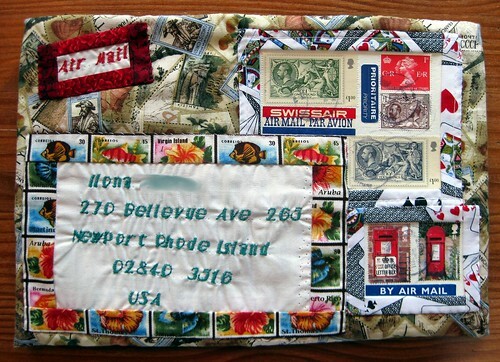 And last but certainly not least, the entire embroidered letter! What handiwork! I seriously cannot even imagine the hours this took her. I suggested to her that people would pay big bucks for this sort of thing if she sold it on etsy or the like, so if she opens a shop, I will refresh this post and link it here for sure. Aside from all this kvelling, I must say this letter really touched my heart. It is now hanging over my writing desk, where I look at it every single day and smile. I don't even think I deserve a gift this wonderful, but I knew I had to share it with you all, my mail-loving readers, who could share my joy in such an incredible creation. This is truly incredible! It's like something out of a fairy tale! WOW! This is just amazing.What a lot of detail work. and BEAUTIFUL fabric. oh my! what a talent! thank you for sharing! Ooh! What a joy is hand-writ art! Pure art, Ilona! It is yours because you deserve it. :) Thanks for sharing. AMAZING! I can't begin to image how long this missive too. I'm in awe! I'm sure this letter touched your heart. It touched mine and I wasn't even the recipient. The fact that there is a human being in the world who can (and does!) create such a wonderful thing, fills me with hope for all of us. 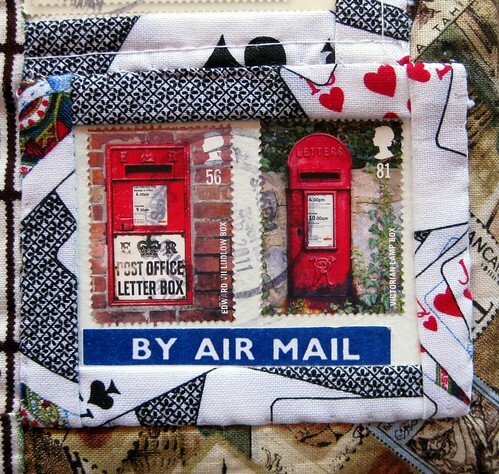 Oh my I am in awe really anyone who can sew has my upmost respect because I dont sew at all . What a wonderful package to receive . I would have been in la la land . 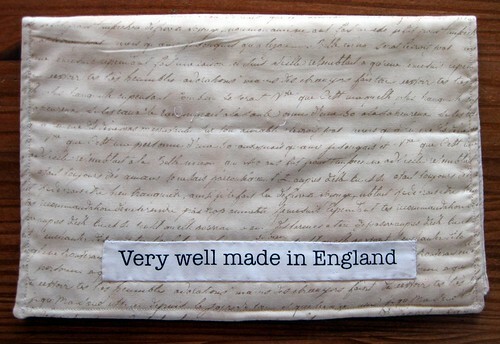 The "Very well made in England" label is very correct! How cool! You get the prettiest mails! Even with a machine, it is still amazing! Truly amazing and unbelievable. What a talent! I too am speechless -- the effort and time and the clever use of materials! !!!!!!!!!!!!! What a delightful treat to receive -- I can't even imagine! 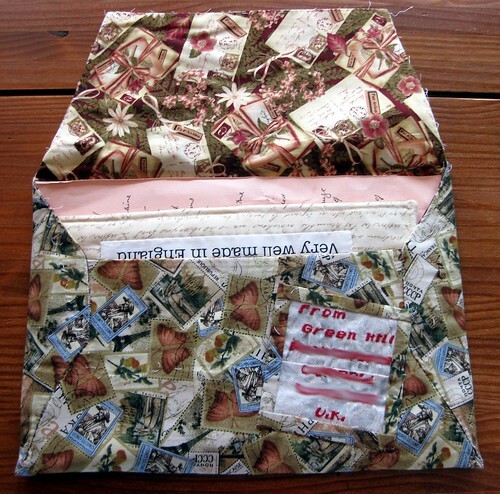 What an amazing envelope and letter.. I am bowled over by your appreciation of this letter. It makes me feel all warm inside. It was a lot of fun to make, and I got to practice with my new sewing machine. I really enjoy the way you commented on the little details. Fabric is a slippery slope!